The blog with an always awesome image caption. Earlier in the year I walked a distance of 29km with a friend, from Masinagudi to Ooty up the 36 hairpin bends. I posted a few photos from this trek on the road and it became one of the most viewed and searched term hitting this blog. For the hairpin bend lovers, haters, searchers and seekers I am posting more photos of hairpin bends from the walk as my New Year gift to you. After a 10km walk on the plain, we were at the first hairpin bend. The day after I landed in Lunglei, my uncle invited me to an Advance Christmas function at his school Baptist Higher Secondary School. He teaches there and currently serves as the Principal. Besides, a couple of staff there are regulars at misual.com, a 7 year old blog I helped founded, I could meet them. I wanted to have a haircut. I drove down to Bawngkawn, the nearest concentration of barbers. But I wasn’t the only one who wanted a haircut on Christmas Eve. All the saloons were packed. After going back and forth, I settled on my regular on. It was Dec 20 and the World was going to end the next day. Dressed in my only formals I was on my way to attend a wedding, what could have been the last wedding if the World did end. This is the church where the wedding took place. Electric Veng Presbyterian Church, Aizawl. 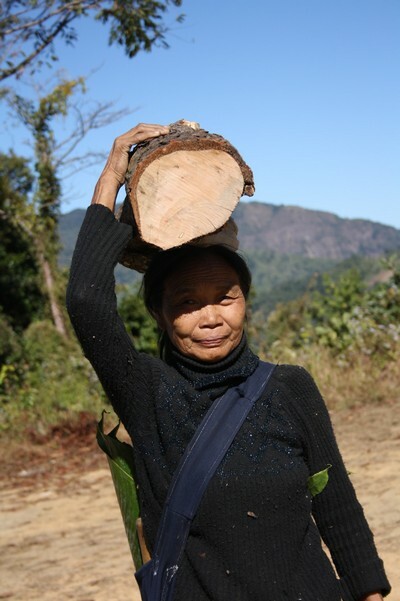 An elderly Mizo woman carrying a chunk of log for firewood on her head at Thenzawl. She caught us wandering around at the campus of Government High School, Thenzawl. I asked to photograph her and she happily agreed.